While researching timber frame homes, you may have seen the words “post and beam” and wondered if they are related to timber framing — or perhaps even a synonym for timber framing. 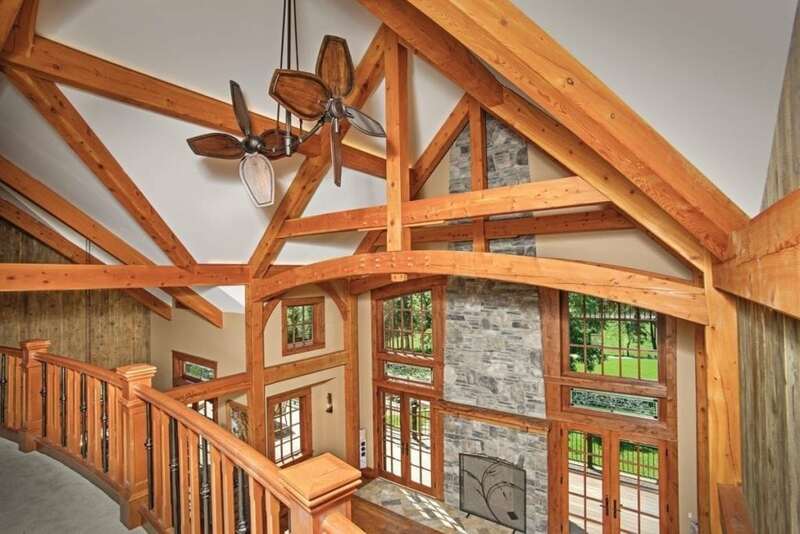 This article explores the differences between post and beam and timber framing because, although post and beam and timber framing share some attributes, they are two different approaches to building a home. By learning details about both, you may find you prefer one over the other. What is Traditional Timber Framing? Timber frame bents are assembled on the ground and then raised into place. Raisings are sometimes ceremonial in nature as friends, family, and soon-to-be neighbors, gather to watch your home take shape. Timber frame’s raising process as part of a home’s construction is very different from that of post and beam building. The Industrial Revolution [ii] transformed the ways in which manufacturing processes occurred. The decades-long transition saw a movement away from hand crafted goods to machine produced ones. It is not a coincidence that post and beam building took hold during this same period of history. Because, in comparison to the traditional timber framing method of mortise and tenon, post and beam building typically results in a less intricate connection. There are two main differences between timber framing and post and beam. First, post and beam structures are constructed by placing the wood pieces on top of each other rather than raising the assembled bent into place. 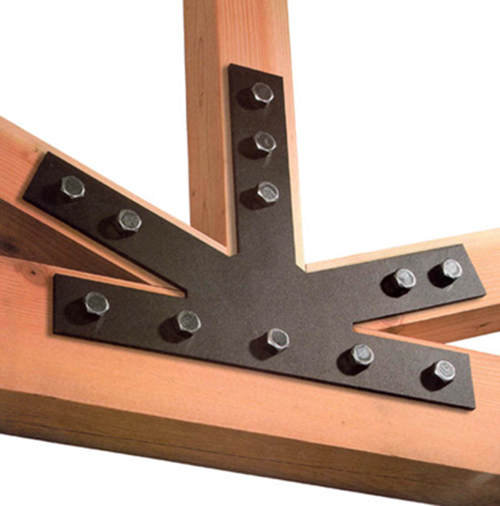 Second, post and beam building uses metal fasteners to connect the wood pieces. Based on a client’s aesthetic preferences, fasteners can be strategically hidden from view or boldly displayed. If your primary consideration in a timber home is simply that it have timbers rather than traditional timber frame artisanship, then post and beam building may be right for you. If, however, you are looking for a structure with Old-World style bents using mortise and tenon joinery, you may find yourself more satisfied with an authentic timber frame residence. While both post and beam and traditional timber framing bring an unique look to a home’s interior, our passion and pride is firmly attached to the latter. The timber frame artisans at Riverbend are committed to (and renowned for) their craft. Our team believes that each timber connection in your home has its own character. And, it is the legacy of timber framing’s time-honored tradition that binds us to those of you seeking an authentic timber frame home. 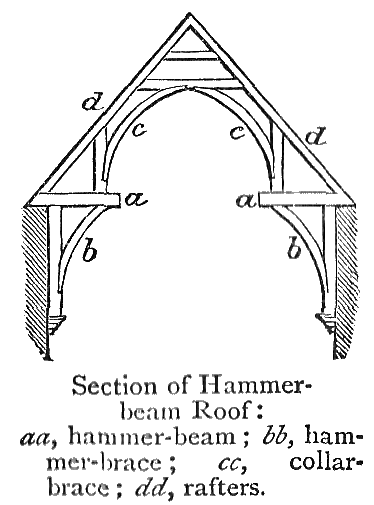 Photographs: Hammerbean truss image from Chambers’s Twentieth Century Dictionary of the English Language, 1908, via the Project Gutenberg archives. Project Gutenberg offers over 58,000 free eBooks. [i] Learn more about engineering in timber frame building by visiting the Timber Frame Engineering Council page of the Timber Framers Guild website here. [ii] Historians do not agree on the dates or range of dates of what is termed the Industrial Revolution. Additionally, the period increasingly referred to as the Technological Revolution, or the Second Industrial Revolution, may be of no less than significance to the advent and adaptation of post and beam construction. You can learn more about this historically important era in Stephanie Muntone’s work, “Second Industrial Revolution” from the McGraw-Hill Companies on www.education.com using the Wayback Machine.